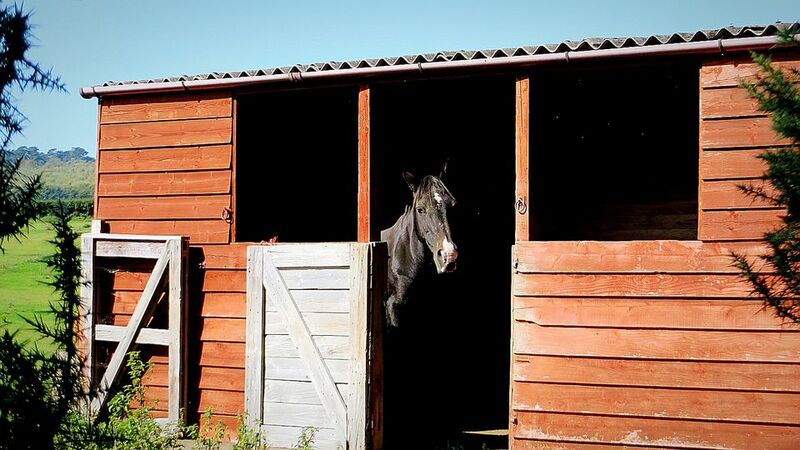 Horses and ponies may need a shelter that is clean, dry, and protected from the weather. Horses can stay warm on their own as long as the weather is reasonably still and dry, even if it is very cold. But when a frigid wind blows, or their coats become wet, they can become chilled. It’s also not good for their hooves to be continually wet. Run-ins can also provide shade and some relief from biting insects. Some people like to stable their horses, others prefer to leave them outdoors. There are advantages to both methods of housing. Even if you do put your horse in a stall for periods of time, it can still be a good idea to have a run-in. However, if you've weighed the pros and cons and decided to build a run-in shed here are some recommendations for design. Place your shed in an area that will not flood. You won’t want your horse standing in the wet, and the wood along the bottom of the shelter will be more susceptible to rot. It will also be more difficult to keep the run-in footing clean. Place the back wall to the prevailing wind. The prevailing wind doesn’t always come from the north, so check local weather patterns. Position the shelter so it is well away from gates or fences. This makes cleaning easier and there will be plenty of room for horses to get in and out. This will also be safer, as horses won’t crowd and bump into fences, or lean on gates. Design your shelter large enough that all of your horses can stand and lie comfortably in it, and bossy horses will not be able to completely ban the underdogs from entering the shelter. A recommended size is about 100 sq. ft. (9 sq m) per average sized riding horse -- about the same size as a box stall. However, if you can provide a larger space, do. Bossy horses may make it difficult for others to stay in the shelter if there is limited space. Consider making it portable so it can be dragged to different locations. This helps with hygiene, and the shelter can be moved if flooding does become a problem. This is also an option where local rules disallow permanent structures of more than garden shed size. Consider making the entrance large enough for a tractor bucket to get through for easy clean-up. Horses will likely drop manure in the run in, and if daily cleaning isn’t possible, it can cause quite a mess. Making your run-in entrance large enough for a tractor also means there’s plenty of room for horses to get in and out. Be sure the ceiling is high enough that a horse will not be able to hit its head, even if snow drifts in at the entrance. Ideally, a ceiling should be eight feet or higher. If the structure is permanent, you may decide to put concrete, brick or paving stone flooring down. This makes cleaning easier. Earth flooring is easier on the horse's legs and may be warmer. It is more difficult to clean. We've found we need to replace the earth in our run-in over the years. We clean daily and in doing so, we take a bit of soil with the manure each time. This results in the ground level lowering over time. It needs to be built up every few years to prevent it from turning into a puddle during spring thaws or heavy rains. Some structures can be noisy in the wind. Construct your shelter securely. A noisy tarp roof or loose metal siding might discourage horses from using it as well as present a safety hazard. The sturdier your construction the better. 6"X6" uprights withstand bumping from horses better than 4"X4" lumber. Check the building code in your area for specific requirements and whether or not your structure requires a building permit. If your design doesn't already include it, consider putting eaves-trough over the entrance. This way, icy patches will not be formed at the entrance from water dripping off the roof and you and the horse won't be surprised by cold trickles of water as you go in and out. If you plan to use your run-in for veterinarian work, grooming and hoof trimming and other activities you may want a light and possibly water in your run-in. If possible, a GFCI outlet and safe lighting is handy to have. Be sure when your construction is complete that there are no nails or screws, edges of metal siding, protruding lumber, or other obstacles that a horse could injure itself on. Be sure to clean up the construction site too. You may not want to build a run-in from scratch. You can choose to build your shelter from scratch or there are many pre-built designs available. Many of these designs are roomy, attractive, but still portable.